Ten leading edge companies were recognized Tuesday, February 27th with Pittcon Today Excellence Awards at the annual Pittcon Conference and Expo in Orlando, Florida. The award is delivered to new products recognized for ingenuity and innovation in laboratory science. 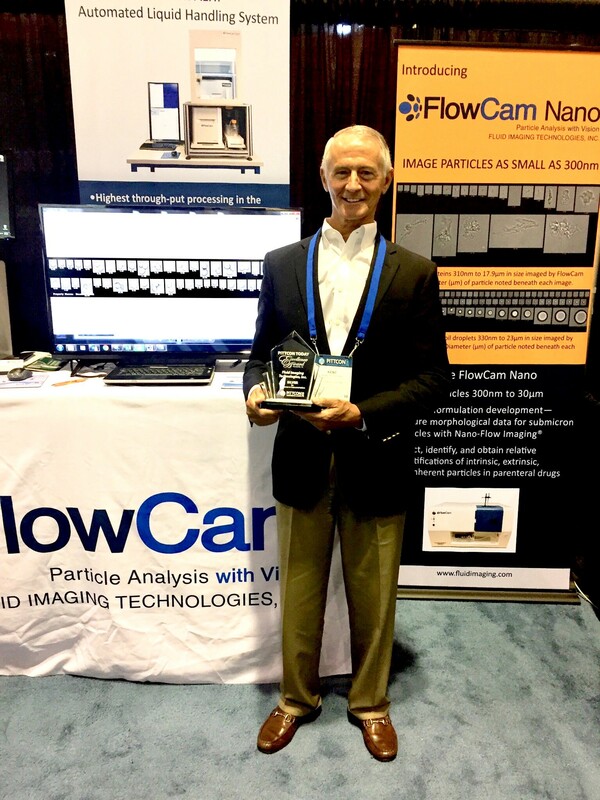 Fluid Imaging Technologies received the Silver award for the FlowCam Nano and it's Nano-Flow Imaging™ capability. Pictured at left: Kent Peterson, CEO Fluid Imaging Technologies, Inc. at Pittcon 2018. Winners were selected by a panel of judges based on ingenuity, creativity, implementation, and outcomes, as well as the product's projected impact on the industry and wider public. "We are thrilled to have been selected as a winner in the Pittcon Excellence award at this year’s conference", says Kent Peterson, CEO of Fluid Imaging Technologies. "The patented FlowCam Nano was born of a vision years ago for a disruptive improvement in the limited resolving power of a standard air objective flow imaging microscope. Through the unique combination of oil immersion microscopy, a blue LED, along with a higher power objective, we have been able to detect and image particles in the nanoparticle range, something not previously possible", elaborates Peterson. The key advantage of the Nano is its ability to image and identify, in real time, particulate matter in a fluid where the morphology of the particles is critical to their characterization. The technology for the detection and imaging of nanoparticles has evolved significantly in recent years due to the developed applications for, and newfound implications of nanoparticles in consumer products and the environment. The FlowCam Nano represents a significant step forward in nanoparticle technology with its unique ability to image and characterize nanoparticles in real time. Fluid Imaging was included with and competed against Horiba Scientific, Xylem, OI Analytical, and Shimadzu Scientific; companies with revenues in excess of $100 million. Other winners include B&W Tek, Metrohm and CEM Corp. Learn more about the technology behind the FlowCam Nano. Visit the FlowCam Nano product page.